Communication is fundamental for our world to function. For communication to take place, at a bare minimum, there must be a sender, a receiver, and a message. For communication between teachers and students to take place, there must also be some kind of good relationship between the two parties. Communication is important because teachers and students can support each other to have a successful class. Students hold back questions because they don’t want to be subject to peer-pressure or due to embarrassment. This research paper will present information on how technology tools can help students feel more confident and will explore the tools that students use on a daily basis in the classroom and outside the classroom. The counseling office gets so many complaints on how students are not able to communicate effectively with teachers due to lack of confidence. Although, students do not say it but we are able to determine that. Many students find it hard to ask questions face-to-face due to different factors, such as not wanting to look dumb or wanted to be self-sufficient. There are many reasons why students should ask questions, such as to learn more, save time, enjoy the class more, show you care, help others, increase confidence, and take control over learning. According to Bowker (2010), “ his suspicion is that many of us have had negative experiences with questions, painful experiences of annoyance, frustration, and anxiety. There are many factors that influence the assertiveness and behavior of students in the classroom, such as emotional development, peer-pressure, socioeconomic status, and technology and social media accessibility or usage. “Philosophers, cognitive scientists, anthropologists, and psychologists have argued convincingly that the act of questioning is central to thinking, to storing and communicating knowledge, even to several important types of social interaction. But while scholars of higher education have written extensively on the topic of questioning for more than a century, they have focused on how teachers ask questions and how students answer them, largely neglecting to consider that helping students develop their own questioning skills might be a valuable pedagogical objective in itself. In this question-centered pedagogy, the questions themselves are the answers.” (Bowker, 2010) In other words, Bower stated that researches have focused more on how teachers ask but haven’t focused in helping students asking fundamental questions. Student empowerment is fundamental to have successful students in the classroom. Through analysis of data collected in a survey administered to students through the local school district services, students will have the ability to answer questions based on their personal experiences with social media and whether they feel more assertive when they are able to ask questions in the classroom by using an app or web-tool. 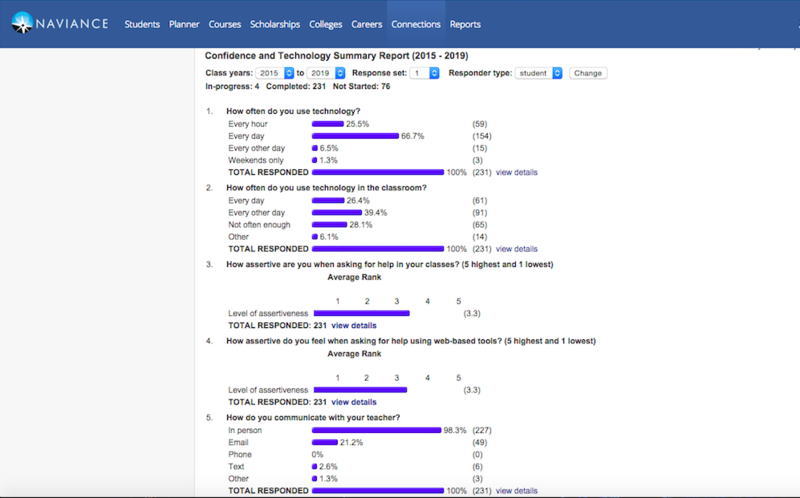 During the course of this study, students were given a survey during their social studies class, the survey contained specific questions in regards to the correlation of confidence and technology.